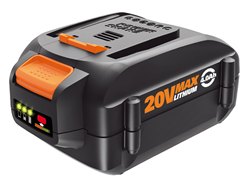 WORX® has introduced its most powerful 20V battery with the new 20V MAX 4.0 Ah battery. This pint-size lithium-ion power station features twice the run time of the 20V 2.0 Ah battery enabling users to get more from their lawn and garden and DIY tools. The 20V 4.0 Ah battery is compact and weighs 1.5lbs. 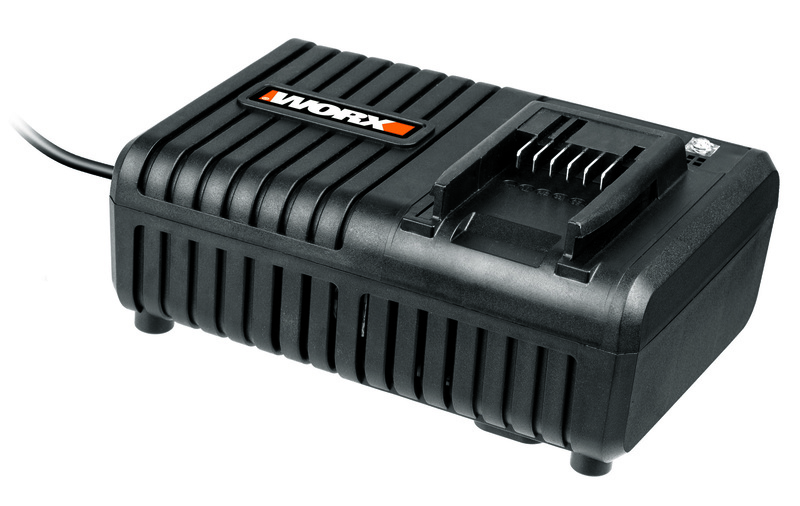 The battery is compatible with all WORX 20V lawn and garden and DIY tools and is part of the WORX 20V Power Share program. The battery features a built-in fuel gauge. Users can monitor charge levels by pressing an electronic keypad that signals the battery’s charge status. When charging the 4.0 Ah battery, a conventional WORX 20V charger takes up to five hours. Optional WORX 20V chargers including the 60 minute (WA3868, $39.99) and 25 minute charger (WA3835, $49.99) take 2 hrs. and 50 minutes respectively, to reach full charge. At a bare minimum, the 4.0 Ah battery doubles run time for all WORX 20V lawn and garden and DIY tools. If it’s a 1.5 Ah battery, run time increases more than 2-1/2 times. A number of tool manufacturers offer bare tools and accessories today. A bare tool is considered the tool by itself without a battery or a charger. This bare bones approach saves consumers money because in most cases they already have a battery and charger from a previous purchase. The other advantage is that it allows the user to cherry pick the battery and charger they’d like to use with the bare tool. WORX Power Share program is no exception. It gives users the ability to mix and match by buying the tools, batteries and charger they want with minimal expense. The 20V WORX Power Share program features more than a dozen cordless yard and garden and DIY tools, plus combo kits powered by the same interchangeable 20V battery, resulting in significant savings and convenience. A sampling of the 20V Power Share tools include the innovative WORX Switchdriver, Axis combination reciprocating and jig saw, TURBINE leaf blower, JawSaw, hedge trimmer, drill-driver, impact driver, oscillating multi-tool, and more. Many of the WORX 20V tools in the program start at $49.99. For example, WORX GT® 2.0 20V String Trimmer/Edger/Mini-mower-Tool Only (WG160.9, $49.99) converts from a trimmer to a walk-behind, wheeled edger or mini-mower in seconds. It features an automatic, single-line feed system and Free Spools for Life. Another handy yard tool for quick clean-ups is the WORX 20V TURBINE Leaf Blower-Tool Only (WG546.9, $49.99) which employs TURBINE fan technology. For do-it-yourself jobs indoors and out, a great installer’s tool is the WORX 20V Switchdriver Drill-Driver-Tool Only (WX176L.9, $49.99). It has dual-rotating ¼ in. chucks to quickly switch between drilling and driving tasks. Electronic torque control provides a range of torque setting for screwdriving and drilling jobs. The WORX 20V MAX 4.0 Ah battery (WA3578, $69.99) is available at worx.com and Amazon. To learn more about WORX Power Share program, visit worx.com.